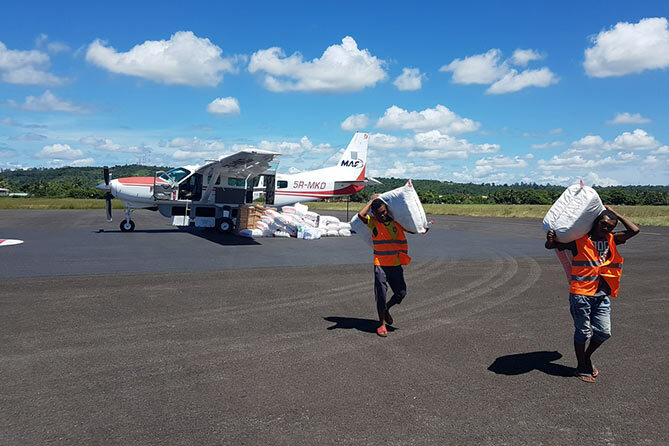 In early April, the MAF team in Madagascar flew 375,200 live doses of measles vaccinations to assist in the flight against this killer childhood disease. Madagascar is currently experiencing a severe outbreak of the life-threatening disease, which can cause blindness, pneumonia, brain swelling and death. Measles is an extremely contagious and when combined with high levels malnutrition found among children in Madagascar, often results in tragic outcomes. More than 100,000 cases of measles have been registered since the measles outbreak began in September 2018 and hundreds of children have died. The newspapers report many tragic stories of whole families, who have never been vaccinated, losing several children to the disease. The disease spread quickly across the country after the first case was reported in a poverty-stricken area of Antananarivo (Tana). The World Health Organisation (WHO) and the United Nations Children’s Fund, UNICEF estimate that only 58% of the population was vaccinated against measles when the outbreak began, a level of coverage insufficient to prevent a severe outbreak. A vaccination campaign was put together in collaboration with several Non-governmental Organisations and the government to reach 7 million children. Every child between the age of 9 months and 9 years of age will be offered the vaccine for free. In previous campaigns, families receiving the vaccine had to fund the follow-up dose themselves. The cost was well beyond the reach of ordinary Madagascans in a country where 92% of the population lives on less than 2 US$ a day. It is hoped that up to 94% of Madagascans will be covered by the current campaign, a level that is vital to maintain if future outbreaks are to be prevented. 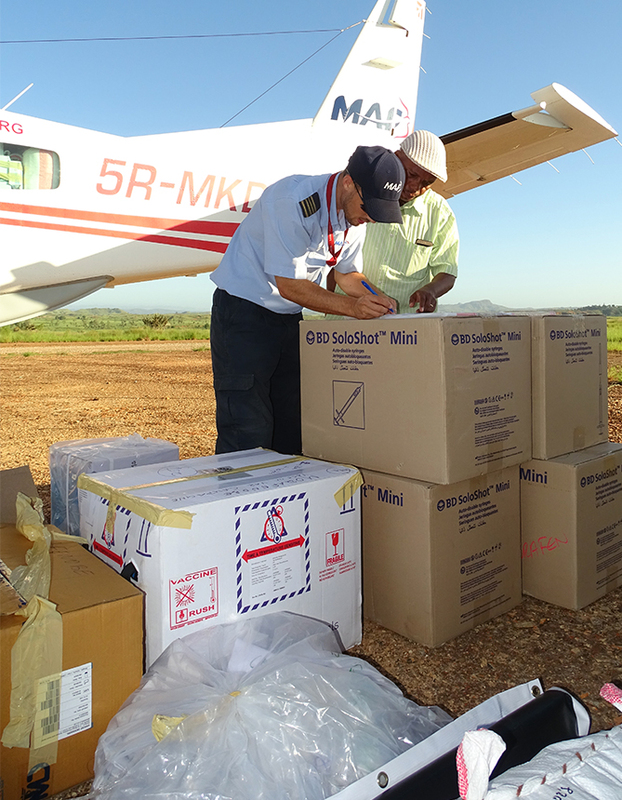 MAF Madagascar was called in to fly vaccines which will prevent the spread of Measles in remote communities. 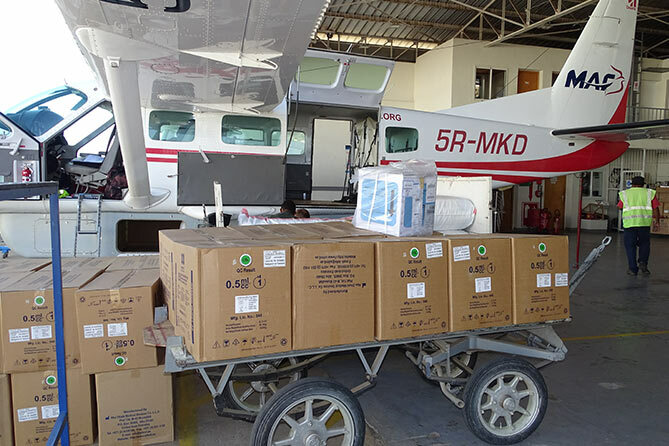 Last week the hangar was packed with vaccinations, syringes, cotton, vaccination cards and everything needed to be able to complete the vaccination campaign in the isolated villages. The vaccines were flown in boxes packed with enough dry ice to keep them cold for approximately four days. 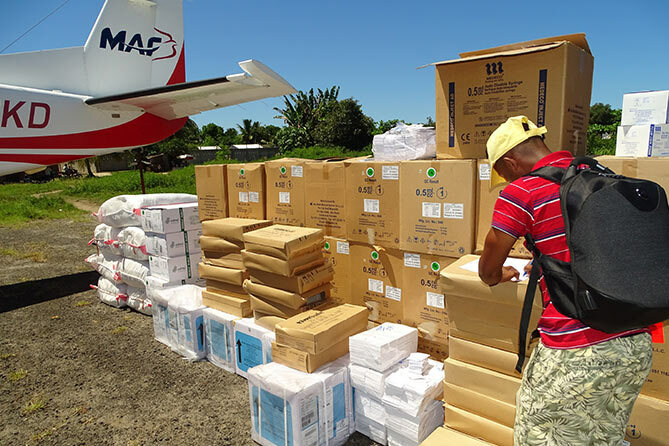 MAF’s Charlotte Pedersen, watched in the early morning last Sunday, as the vaccines were loaded into every little corner of the MAF Cessna Caravan. She accompanied one consignment of vaccines to their destinations at Morafenobe and Ambatomainty, an hour’s flight away by plane. ‘It is still the rainy season and everywhere I look, I see green,’ Charlotte reports, noting the climate and difficult terrain beneath her, that the plane is helping to overcome. ‘We quickly get to unload the plane. Tomorrow the first of 7,000 children will get their much-needed measles vaccinations in the district of Morafenobe! ‘Before leaving, the pilot sweeps the “floor” under the propeller – the airstrip is full of little and larger rocks. “We don’t want them to hit the propeller…” Ryan explains to the rather strange looking audience that follows every move he makes. ‘It is 7am as we take off towards Ambatomainty where we repeat the drill before heading back to Tana getting ready to load the Caravan one last time this Sunday morning. After two more drop-offs in Mananara and Sainte Marie more than 50,000 children will be able to get their measles shot. There will be a lot of screaming going on in the isolated villages of Madagascar next week. But let´s rather have the children screaming for a few minutes than the mothers crying for the rest of their life grieving for the loss of their beloved child,’ Charlotte reflects.